(Nanowerk News) Hailed as a "cross between a high-speed centrifuge and a cotton candy machine," bioengineers at Harvard have developed a new, practical technology for fabricating tiny nanofibers. The reference by lead author Mohammad Reza Badrossamay to the fairground treat of spun sugar is deliberate, as the device literally—and just as easily—spins, stretches, and pushes out 100 nanometer-diameter polymer-based threads using a rotating drum and nozzle. The invention, reported in the May 24 online edition of Nano Letters, could be a boon for industry, with potential applications ranging from artificial organs and tissue regeneration to clothing and air filters. The researchers have filed a patent on their discovery. Schematic of Rotary Jet Spinning Process. Left: A diagram of the rotary jet spinner; upper right: The resulting "spun" nanofibers; bottom right: The nanofibers viewed at 10µm. "This is a vastly superior method to making nanofibers as compared to typical methods, with production output many times greater," says co-author Kit Parker, Thomas D. Cabot Associate Professor of Applied Science and Associate Professor of Bioengineering in the Harvard School of Engineering and Applied Sciences (SEAS); a core faculty member of the Wyss Institue for Biologically Inspired Engineering at Harvard; and member of the Harvard Stem Cell Institute. "Our technique will be highly desirable to industry, as the simple machines could easily bring nanofiber production into any laboratory. In effect, with this technique we can mainstream nanotextiles." By contrast, the most common method of creating nanofibers is through electrospinning, or sending a high voltage electric change into a droplet of polymer liquid to draw out long wisps of nanoscale threads. While effective, electrospinning offers limited control and low output of the desired fibers. The Harvard researchers turned to a simpler solution, using rotary jet spinning. Quickly feeding and then rotating the polymer material inside a reservoir atop a controllable motor offers more control and greater yield. When spun, the material stretches much like molten sugar does as it begins to dry into thin, silky ribbons. Just as in cotton candy production, the nanofibers are extruded through a nozzle by a combination of hydrostatic and centrifugal pressure. The resulting pile of extruded fibers form into a bagel like shape about 10 cm in diameter. "The new system offers fabrication of naturally occurring and synthetic polymers as well as a lot of control over fiber alignment and web porosity, hierarchical and spatial organization of fibrous scaffold and three-dimensional assemblies," says Badrossamay, a postdoctoral fellow in the Wyss Institute and member of Parker's lab at SEAS. The researchers tested the new device using a variety of synthetic and natural polymers such as polylactic acid in chloroform, a biodegradable polymer created from corn starch or sugarcane that has been used as eco-friendly alternative to plastic in items like disposable cups. Moreover, the rapid spinning method provides a high degree of flexibility as the diameter of the fibers can be readily manipulated and the structures can be integrated into an aligned three-dimensional structure or any shape simply by varying how the fibers are collected. The shape of the fibers can also be altered, ranging from beaded to textured to smooth. Parker's Disease Biophysics Group (DBG), which has extensive expertise in cardiac tissue engineering, also used the technology to form tissue engineering scaffolds, or artificial structures upon which tissue can form and grow. Heart tissue from rats was integrated and aligned with the nanofibers, and, as seen in past studies, formed beating muscle. "I was visiting the Society of Laproscopic Surgeons a couple of years ago to look at the equipment demos and it dawned on me that we needed to develop techniques to miniaturize scaffold production so we could do it in vivo. Our finding is the first step," explains Parker. "The initial testing suggests that our technique is incredibly versatile for both research and everyday applications. 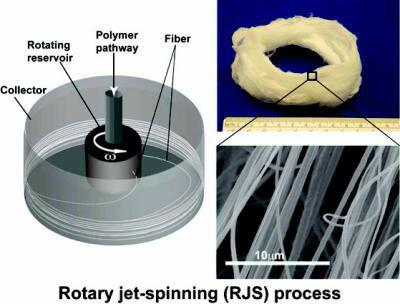 As rotary jet spinning does not require high voltage, it really brings nanofiber fabrication to everyone." The researchers expect to further refine the process for tissue engineering applications and to look for opportunities to exploit the advance in other textile applications.